Just when winter weather starts to really get on your nerves, Mother Nature serves up something special: Large stonefly adults that get fish looking up. “Look at this,” Hughes said. I looked over from my camp chair where I was enjoying my morning cup of tea to see Dave Hughes fifty feet away pointing at something in the water. About two feet out from the bank, and twirling in little surface currents like the hippo in Fantasia, was a bug. An unlucky grasshopper I thought. Just how unlucky was quickly confirmed when it disappeared in big swirl. Before I could set my tea down and walk the fifty feet to where Dave was standing, he was gone to unpack his rod from its tube and rig up. We had driven most of the previous day and pulled into the campsite, a nice wide sandy bar shaded from the wind by some scruffy alders and willows, too late to fish. We had put off this trip long enough, but even though it was now the second week of April winter seemed unwilling to let go of its grip on this high desert stream. The leaves on the willows were still unfurling, the water was ice cold, and the wind hustled out of the northeast cold enough that snow seemed a real possibility. But our timing was just right for one inhabitant of this river. When I took a look at the willows where Dave was standing I saw two dark insects about an inch long crawl quickly down the willow stems. One lost its footing and plopped into the water’s surface where it began dancing in the current just like the first. Faster than I could say Skwala americana a big swirl engulfed the poor stonefly and it was gone. I’m happy to report that for the next three days big swirls also opened up under the dry flies Dave and I threw out onto the water’s surface and drifted near the banks and under the willows. It turned out that Dave and I had landed at the perfect time for the spring hatch of Skwala stoneflies. 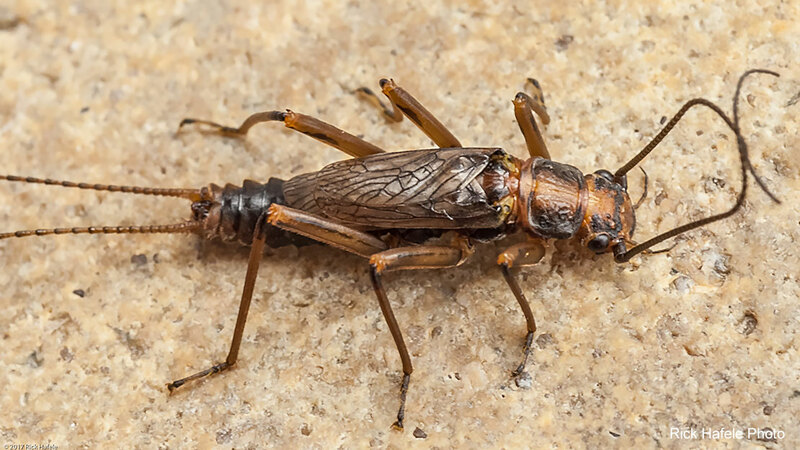 Skwala is just one genus of the stonefly family Perlodidae. With 31 genera and over 120 species, the family Perlodidae is one of the most diverse of all stonefly families. 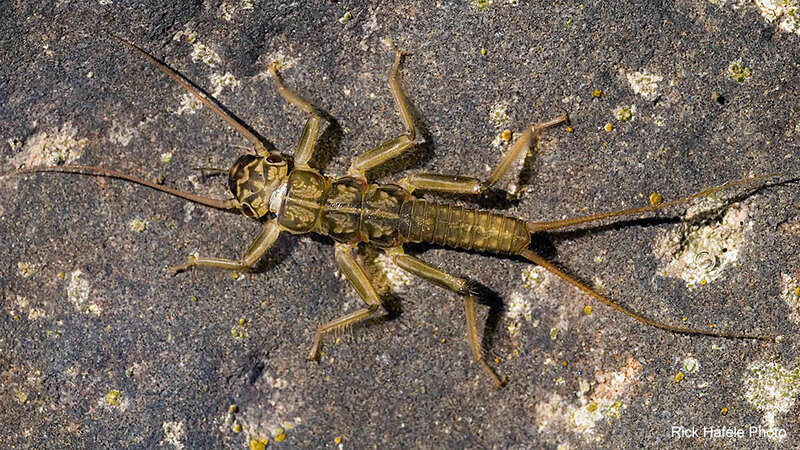 Because of the diversity of species in this family, anglers often get confused about just what stonefly they are seeing when these are on the water. To simplify things a bit the family is divided into two major sub-families, Perlodinae and Isoperlinae, which can often be distinguished by size; most Perlodinae are three quarters to a little over one inch long, while most Isoperlinae run about a half inch long or less. Skwala falls into the large-sized Perlodinae sub-family along with two other important genera to the angler, Megarcys and Isogenoides. Common names for the major species in these genera include Blackfoot springfly (Isogenoides colubrinus), Indiana springfly (Isogenoides doratus), Hudsonian springfly (Isogenoides frontalis), Appalachian springfly (Isogenoides hansoni), Michigan springfly (Isogenoides krumholzi), Larimide springfly (Megarcys signata), Glacier springfly (Megarcys watertoni), Yosemite springfly (Megarcys yosemite), American springfly (Skwala americana), and curved springfly (Skwala curvata). The family Perlodidae is widely distributed with different species spread across all of North America, but the large species in question here primarily occur in western streams from the Rocky Mountains to the coastal mountains along the Pacific Ocean. None of the species of Megarcys or Skwala, for example, occur east of the Rockies. Several species of Isogenoides, however, do find their way into eastern streams, and with common names like Indiana springfly, Michigan springfly, Hudsonian springfly, and Appalachian springfly, it is not hard to guess where. All these species are predators as nymphs, which crawl actively along rocky bottoms in search of prey like small mayfly nymphs and midge larvae. Their preferred habitat is quick choppy riffles with a substrate of large gravel and cobble. They tend to be most abundant in large low elevation rivers and moderate sized mountain streams with just a few species, like Megarcys signata, occurring in high elevation headwater streams. Because of the nymph’s predacious nature and active hunting style, nymphs end up in stream drift where trout have a chance to see them. A study of trout food preferences in Rocky Mountain streams ranked perlodid nymphs fifteenth out of ninety different stream insects in availability to trout, so when these nymphs are present and abundant they can be well worth imitating. Given the diversity and overlapping appearance of these species, determining which perlodid lives in your home waters can be tricky. The good news is that one doesn’t need to know which genus or species is present to select a proper pattern and fish it effectively. If you do want to determine which perlodid lives in your local waters identifying specimens to the genus level is not beyond reach. The three important genera mentioned here, Skwala, Megarcys, and Isogenoides, while similar have a few distinctive features. First, if you live in the Midwest or East, species of Megarcys or Skwala can be ruled out, and species of Isogenoides are typically the most common and abundant, though a few other similar looking genera do occur locally in Midwest or eastern streams. If you live in the West, look carefully at the nymph’s thorax for gills. Nymphs of Megarcys, for example, have small single finger-like gill filaments at the base of the legs on each thoracic segment, while Skwala and Isogenoides nymphs have no gills on thoracic segments and only two small finger-like gills under the head. Nymphs of most species have quite noticeable dark markings on top of their head, thorax, and abdomen. Adults can be even harder to distinguish than nymphs, so you are best off collecting a few nymphs at the same time and location you see adults active. Since many of these species are nearly as large as the common golden stones (family Perlidae), I have found that anglers sometimes think perlodid adults are early hatching golden stones. The spring perlodid adults however, typically hatch a month or two earlier than golden stones, have dark chocolate to burnt-orange colored bodies rather than golden brown, and though large, they are not as large as golden stone adults. Dave seemed to have his rod together and treating his dry fly with floatant before the rings from the second rise had even disappeared. “What did you put on,” I asked, curious to see what fly he selected so quickly. “It’s a Skwala adult pattern someone sent me but I can’t remember who or what it’s called,” he replied. Great, I thought, he’s going to have the perfect fly and I’ll have to beg him for some. Dave waded out from the bank so he could cast upstream back in towards the shore and get a nice drift near the overhanging willows. The first four or five casts came back to him without the hint of a fish being nearby. Finally, his cast reached a little pocket of quiet water behind a downed willow trunk. The fly hung for a moment in the slack water, then just as his line started to drag it away there was a swirl like the ones we saw under the dancing naturals and Dave had on a big brown. He followed that one with a couple more before I could even get my rod together. I tried to get one of Dave’s flies from him, but every time I asked for one he pretended he couldn’t hear me. Dave has claimed to have bad hearing for years and it always seems to get worse when he’s asked for a fly. Since I didn’t have his “special” Skwala pattern, I tied on a size-10 stimulator with a dark brown body and light tan wing. Fifteen minutes went by without a touch and I thought I was going to have to start really begging for one of Dave’s flies, when my fly disappeared in another big swirl. We ended up catching fish with a number of different patterns. As long as they had a dark brown body on about a size-10 or 8 hook the specific pattern didn’t seem critical. The real key seemed to be the presentation. A good drag-free drift close to a bank that had some depth and a little structure or overhanging grass or willows, was almost always rewarded with a swirl and disappearing fly. One thing we noticed was how few adult stoneflies we saw flying. A closer look at the adults crawling around on the banks made it clear why some of them weren’t flying; their wings were only about half as long as their abdomens and too small to be of use. What they lacked in wings they made up for in crawling speed. It turned out these were all males. The females had normally developed wings and could fly, but they too were generally seen crawling quickly along the shore in grasses and willows. This certainly explained the need to get our flies close to the banks, since the adults were crawling or falling in from shore rather than flying out over the water. Interestingly adult stoneflies with short non-functional wings, a condition known as brachyptery, occur in a wide variety of stonefly species. The number of adults we saw wasn’t huge, but we never had to fish nymphs during this trip to catch fish. As I mentioned it was the second week of April, which corresponds to a typical time for the emergence of these large perlodid adults. 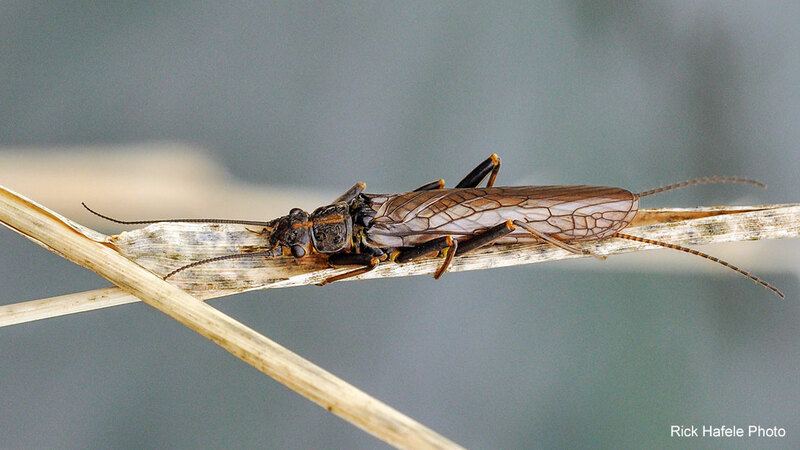 Depending on weather, the specific species, and geographic location, these stoneflies can begin hatching as early as March or as late as July, with March, April, and May being prime times in most places. If you are too early for adults pay attention to the nymphs. Prior to adult emergence the nymphs migrate to the banks where they crawl out of the water when ready to become adults. 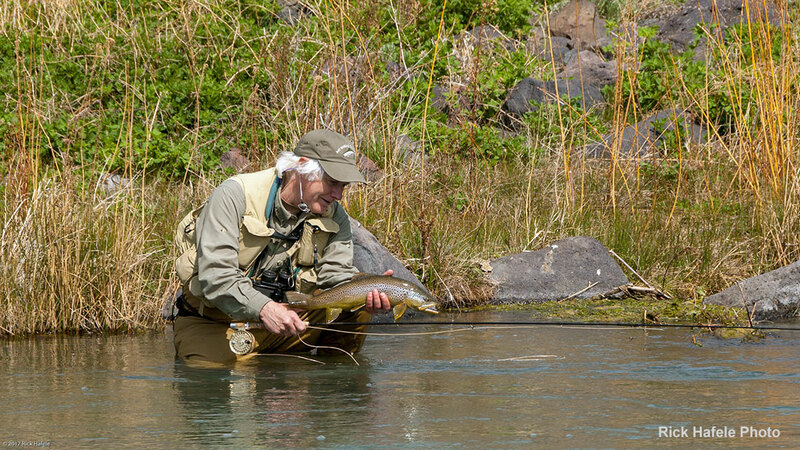 These migrations create the perfect time to fish nymph patterns. Fish your flies dead-drift close to the bottom in riffles and the tailouts below them. As your fly drifts downstream let it swing close the bank and hang near shore where fish might be holding. From my experience fancy nymph patterns aren’t needed. One of my favorites is a beadhead red squirrel nymph on a size 10-3XL hook. You can also use a relatively small size-10, golden stone nymph. It took a while, but Dave finally lost all of his “special” Skwala adult patterns, and for some reason my ears started ringing – probably a change of weather coming I thought – and I couldn’t hear a word Dave said. It didn’t really matter though, these spring stones kept us both busy and smiling. Click Here for the: Skwala Stonefly Equalizer Kit of flies.